Rhona McKail, Emma Selway, Louise Mott, Christopher Lemmings, Joseph Shovelton, Owen Gilhooly, Keel Watson. Visually stunning, on arrival you are greeted by a stage of books, just books. The design, lighting, projections, staging and direction were all superb; successfully portraying the words by Glyn Maxwell and completely synced with the music (by Luke Bedford) which, in visual glory, told a story enthrallingly. The story, or libretto, or whatever you wish to refer to it as is unclear, even by the authors’ own admission. Maxwell describes the story purely as “This world” and indeed the words have plenty to say about “This world”. The story centres on the relationship between humanity and the resources of the earth, using Milton’s Paradise Lost as its starting point. It’s very curious, in an almost religious context: somewhat biblical but also somewhat true to “This world” as described by Maxwell. Bedford’s composition is well crafted and if tonight has shown me anything, it is that the relationship between the librettist and the composer is vital or at least that the composer has the librettist’s intentions and motives “in their head”. Both words and music came together nicely like two swans elegantly floating in the river’s current; it worked. I enjoy Bedford’s very modern recitatives, used throughout the opera; chords from the instrumental ensemble followed by the vocal line which moved the opera along nicely. Not that I wish to overlook the rest of Bedford’s score, which at times can be quite bland, but he championed the harmonic writing for the vocal ensemble; his writing was very choral and also quite religious. The singers too all stuck to the same texture when singing together which was refreshing. Bedford did use long legato vocal lines to portray longing and despair, passion and upset but also portrayed power and greed through a very jumpy vocal line for the Queen (Emma Selway). Bedford took the vocal ranges to their limits and wrote high and challenging parts for the Waitress and Prince testing soprano Rhona McKail and tenor Christopher Lemmings. Rhona McKail was divine: Dramatically and vocally refreshing, what a treat! Not only could McKail sing with her voice she could also speak with her eyes, a truly beautiful performance. Strong performances too from the whole cast. The ensemble, as ever, played with precision and had many a strong moment under the enthused baton of conductor Nicholas Colon. Conducting with his back to the stage, he did so with ultimate knowledge and has firmly stamped his own mark on this work. Overall the evening was sweet: a score of substance and ultimate quality combined with beautiful words with extraordinary creative and artistic direction from the creative team and magnificent staging from John Fulljames. With a great conductor and a fabulous ensemble, no wonder you come out with this. 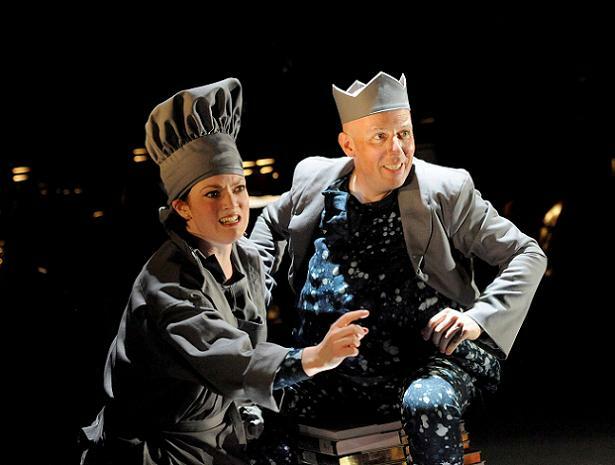 Photo: Rhona McKail as the Waitress, Christopher Lemmings as the Prince.